TMAF co-chairman Kevin Burch gives an update on TMAF progress. LOUISVILLE, KY — Trucking Moves America Forward, the industry-wide image and education movement, reported significant achievements in the past year in its mission to change the public perception of the trucking industry. The program has achieved is goal of putting more than 100 TMAF trailer wraps on the road, said Kevin Burch, TMAF co-chairman and president of Ohio-based Jet Express and a former HDT Truck Fleet Innovator, in a press conference at the Mid-America Trucking Show Thursday. Emphasizing that this is a movement, not a campaign — it will continue, there’s no ending date — Burch noted that this is the second anniversary of TMAF, launched two years ago at MATS. Among the goals for 2015 were expanding the movement’s reach, and building the donor base, which it did. John Elliott with Michigan-based expedited carrier Load One was the buyer of the 100th trailer wrap, Burch explained. He originally had purchased four, but at a recent industry convention, “We only needed 10 more to achieve the goal of 100 and John raised his hand,” Burch explained. The goal for next year is to get the trailer wrap number up to 200.
targeted advertising campaigns, including one aimed at legislators to push them to pass the long-overdue highway bill. Dan Logan, an ATA America’s Road Team captain and a driver for FedEx Freight, pointed out that he has 2.4 million accident-free miles, “and there are thousands of drivers out there that are just like me. Here’s where we come up short. We need to improve the overall image of the industry and that’s why TMAF is so important and the resources the movement provides to help us tell our story. Emphasizing the cross-industry nature of the movement (Burch is second vice chairman of the American Trucking Associations), there also were speakers from the Owner-Operator Independent Drivers Association. TMAF continues to expand its presence online at www.truckingmovesamerica.com, with downloadable videos, advertisements, speeches, editorials, press release, fact sheets and more for those who sign up. The site also now includes a TMAF store, where hats, polo shirts, T-shirts, tumblers, back door decals and other TMAF-branded items are available for purchase. With over 500,000 trucking companies and nearly 3 million trucks on our nation’s roads, trucks move nearly 70 percent of America’s freight. In Nevada we are more reliant on trucking than any other transportation mode, moving 94 pecent of our state’s manufactured tonnage. There is a symbiotic relationship between trucking and every sector of the economy. Retail, manufacturing, mining, energy, agriculture and gaming all rely on trucks, and trucks are reliant on all of these sectors to drive our activity. Trucking is a key element in interstate commerce. This wasn’t always the case. Although the modern trucking industry has existed for over a century it is still younger than the railroad, which still holds tremendous influence over transportation policy today. At the turn of the 20th century, trucks were used in limited local applications. If you needed freight moved coast to coast, rail was your only realistic option. In 1919 a young Lt. Col. Dwight Eisenhower was part of a military convoy from Washington, D.C. to San Francisco, Calif. It took a total of 62 days to make the trip. Nevada was particularly tough. Ike described the roads across Nevada from Utah to Carson City as a “succession of dust, ruts, pits and holes.” It was this trip that solidified his support for an interstate highway system, funded by fuel taxes, which would be designed not just to move munitions, tanks and troops, but interstate commerce. This system has driven our economy since its creation. While the building and maintaining of our roads and highways to ensure seamless transport across our states has had a positive impact on trucking, the lack of stable funding for the interstate system is threatening Eisenhower’s vision. We have not had a fuel tax increase in America since 1992. In fact much of today’s current highway program is funded on budgetary schemes such as pension smoothing which allow companies to forgo tax deductible payments into their employee’s 401k programs, and then use the increased tax revenue for roads. This has led to some states and members of congress to call for devolution, meaning states would keep the fuel tax revenue instead of sending it to the federal government for distribution. Losing sight of how roads connect communities, not just in a particular state but across the country wouldn’t just have a negative impact on the trucking industry, but on all of those economic sectors that rely on the efficient movement of freight. Since 1980 when the trucking industry was economically deregulated it was a goal for trucking to be shaped by market forces under a nationally uniform set of regulations. This was a 180-degree change from where the industry was in 1935 when the federal government regulated truck rates, routes, and the type of freight that could be hauled. Economically deregulating the trucking industry had a huge positive impact on the economy. Freight got a lot cheaper and enabled just-in-time delivery, which eliminated the need for retailers, manufacturers and others to have inventory and raw materials on site. There is no more storeroom at the J.C. Penny’s where they keep inventory not being sold on the floor — that storeroom is now on the back of a truck. Even with innovations such as just-in-time delivery, no truck moves without a driver. Professional truck drivers need a great amount of skill and focus to safely pilot an 80,000-pound truck. For much of the 20th century, truckers were viewed as knights of the road, who would always stop to assist a stranded motorist. The CB culture of the 1970s, which brought us the “asphalt cowboy” has now migrated to truckers as true safety professionals. Although the view of truckers has made a positive turn, it is still a huge challenge to get qualified drivers behind the wheel. Nationwide, we are 48,000 drivers short. We are an overwhelmingly male industry, 94 percent, with an average age of 49 years old. Lack of truck parking, being detained at shipper facilities and government regulation make the freedom of the open road less alluring. As a nation and an industry we need to focus on the implementation of technology, and forward thinking policy changes that look at the transportation system in its entirety, so we can ensure that Trucking Moves America Forward. Paul Enos is chief executive officer of the Nevada Trucking Association. Louisville, Ky. – March 31, 2016 –Trucking Moves America Forward (TMAF), the industry-wide image and education movement, is making significant strides in its mission to change the perception of the trucking industry. 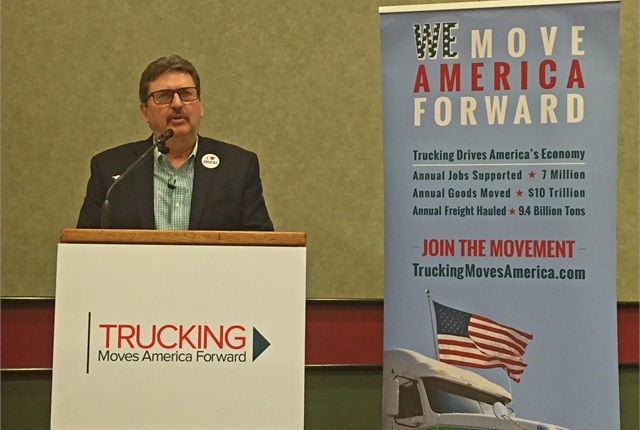 TMAF announced its achievements from the past year during a press conference at the 2016 Mid-America Trucking Show (MATS), the same venue where the organization publicly launched in March of 2014. Leading off the press conference in Louisville, co-chairman of TMAF, president of Jet Express, Inc., and first vice chairman of American Trucking Associations Kevin Burch, cited several successes achieved by a wide range of education and communications efforts, particularly seeing 100 TMAF-wrapped trailers on the road. “After a successful first year, we knew there was still much that needed to be done to work toward changing perceptions and building a more positive image of the trucking industry, and I’m happy to say we’ve exceeded expectations to date,” said Burch. “I want to sincerely thank all of our members and supporters for helping us come this far since launching TMAF here at MATS two years ago. The TMAF-wrapped truck will be parked in the front North Pavilion during the duration of the conference. and more than 2 million impressions due to in-kind donations from media outlets including Transport Topics, Landline Magazine, Sirius XM Radio and more. Todd Spencer, executive vice president and board member of the Owner-Operator Independent Drivers Association (OOIDA), spoke on behalf of industry owner-operators. Professional truck driver Don Logan with FedEx Freight and an America’s Road Team Captain, also spoke about the important role TMAF has played in improving the image of truck drivers across our nation’s roads and highways. Also at MATS, TMAF will encourage industry professionals to join the movement by signing the TMAF Ambassador’s Pledge. Those who take the pledge, at one of the participating show booths – American Trucking Associations, Owner-Operator Independent Drivers Association, Pilot Flying J, Kentucky Trucking Association, Tennessee Trucking Association and American Transportation Research Institute (ATRI) – will be entered into a raffle to win an iPad mini or TMAF-branded merchandise. The drawing will take place on Friday, April 1 at 5 p.m. in front of the trailer featuring a TMAF wrap, in the North Pavilion area. TMAF continues to expand its presence online via www.truckingmovesamerica.com, offering the industry valuable resources. The site’s member resources section provides downloadable videos, advertisements, speeches, editorials, press releases, fact sheets and more for those who sign up. These materials can also be obtained by contacting info@truckingmovesamerica.com. The site also now includes the TMAF e-store, shoptmaf.com, where hats, polo shirts, t-shirts, tumblers, and other TMAF-branded items such as backdoor decals are available for purchase to demonstrate one’s pride in trucking. Throughout 2016, TMAF’s goals will be to continue to activate and engage the industry through education sessions, speeches, marketing and public relations strategies; support local and state advocacy efforts focused on improving highway infrastructure and the operational environment; develop strategies for the public message by aligning with research measurements; continue to build pride within the trucking industry to make trucking an attractive career option; and encourage fundraising at all levels of contributions, big and small. There is also a goal to see an additional 200 trailer wraps on the road.